Here is Navin's suture photo. There are more photos of the incision as it heals in Swannie's thread. tracis, you are a gem. Thank you SO much. :} I took a pic of Bassy's incision tonight and will also post it tomorrow. Compared to some of the others, it seems very clean. Bass ate all of his veggies this evening, and had his second feeding of CC just now. His poops look perfect (fingers crossed that they stay that way). It's so wonderful NOT to hear him cry when he pees and poops. He is spending quite a bit of time resting in his pigloo, which I guess is normal, but isn't lethargic. Next order of business is to find out how in the heck to prevent this from happening again. 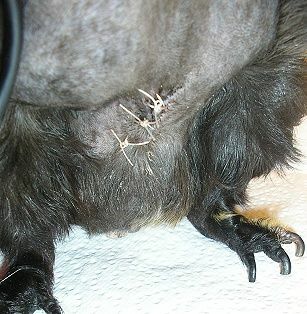 There are pics of Snowflake's healing incision (it was glued) on the surgery page too. I'm so glad that Bassy is eating. We are sending more healing thoughts his way. 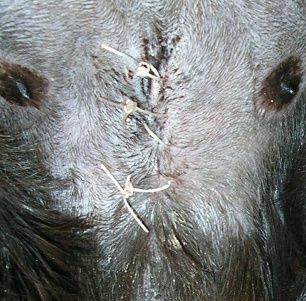 This is a very interesting set of photos from Elly, showing bruising at Meg's incision site. Josephine agreed that the discoloration was bruising, not infection. Meg was spayed. I'm talking about masticated food that some how gets deposited in a pocket way down in the throat. Unless there has been enough time for this food matter to naturally evacuate the pocket, there is a risk that it can end up in the throat, obstructing breathing, while the pig is sedated. Wow, looking back at Henry's spay, that incision was actually pretty nicely done. My regular vet uses glue, which, eh, I prefer the sutures myself. Tracis is the master search-n-finder. How's Bassy this morning? It's great he's already not crying. I bet he's relieved! Woah, that stone and sludge looks -- I mean, how big are pig bladders? Not that huge right? That seems like something I would not be happy with if it were in my little piggy bladder. My sutures, as you saw, were more like fishing line, and not really visible and not easily pick-at-able. But I don't see anything bad about these. Just make sure he doesn't want to remove them himself :). Incision looks clean and smooth. Bassy's like Sanford! He'll eat right off the spoon! Makes life easier for you I'm sure. What a cutie! What a wonderful cooperative patient! And huge honkin' stone! Lots of sludge! If I were you I would also incorporate Becky's suggestion of maybe twice weekly subcues to help flush his system after he's recovered. I know you don't want to go through this again. p.s. I'm guessing I can add these pics to this thread? I bet he's going to feel soooo much better with that all that junk out of there. Yeah, I wondered if he would be inclined to chew on them. I haven't seen him do it so far, so hopefully he'll leave them alone. Dr. M wanted me to give him fluids today and tomorrow for sure. I need to try Mum's subque methods, because my approach doesn't work very well. 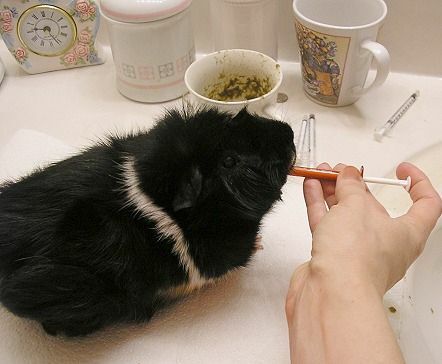 He has quickly figured out that the piggie burrito means getting jabbed, so it's a battle to keep him still long enough to get the needle in and the fluids administered. Lynx -- yes, that's fine w/ me. Thanks! You always take such great pics. Crisp and clear! I wish you success on your subcues. I hope he continues to do well! Bassy must feel very relieved to get rid of all that sludge and that stone. Thanks! I think he feels a heck of a lot better, even with the post-surgery pain. I called my vet's office to ask about butterfly sets. They have ONE left, and it's a 23-gauge with 3/4" needle. Yipee. I'm going to try that tomorrow and see if it's any easier. I had asked this somewhere before, but am still not sure -- if a bag of Ringer's has been opened BUT a new needle and a new syringe are used every time (I use two needles each time; one to jab into the bag, and the other to go into Bass), can the same bag of solution be kept and used for quite some time? I think someone said there is a risk of contamination when used after a few weeks, but what if new supplies are always used with it? I would think this doesn't hold true if you use a Butterfly set with it, though. ? I think Josephine might have commented on this but I unfortunately don't remember what she said. One thing I'd worry about is the warming and cooling of the solution (it should be warmed to room temp before administering). I know it can be used a few times though. I've also been counseled to use different needles each time, one to transfer the fluid into the syringe, and the butterfly to inject it. I'm going to go thru my entire bag in a week, though, so I guess the contamination issue might not be as relevant. I've been running the filled syringe under hot water, to avoid the warming and cooling of the entire bag of solution. Same here; I just warm the syringe and not the whole bag. Amy, you use a butterfly with a syringe? I never thought of doing that way. I was thinking the butterfly had to be attached directly to the bag, and then you have the whole issue of warming the entire bag. What size syringe do you usually use? 35ml? And you use 23-gauge, right? The ones I found online say "5/8" needle, but the one the vet has is supposedly 3/4". How in the heck do you get a 5/8" needle inserted?